The original plan did not include making wing parts, because a different fabrication method was being considered, and it was thought that more research into airfoils, etc., would be required. But, having come this far with the project, my customer made the decision to have me construct the wings, and to include the main gear doors, tail wheel doors, aft outlet door, and to refine the lower intake area. Several things made this complex. First, this decision required remodeling the wing-mounting area of the fuselage, since the original plan was for just the "stub" wings. Second, their was a decision to be made as to whether the wings should be created as a single unit, or split into left/right parts. 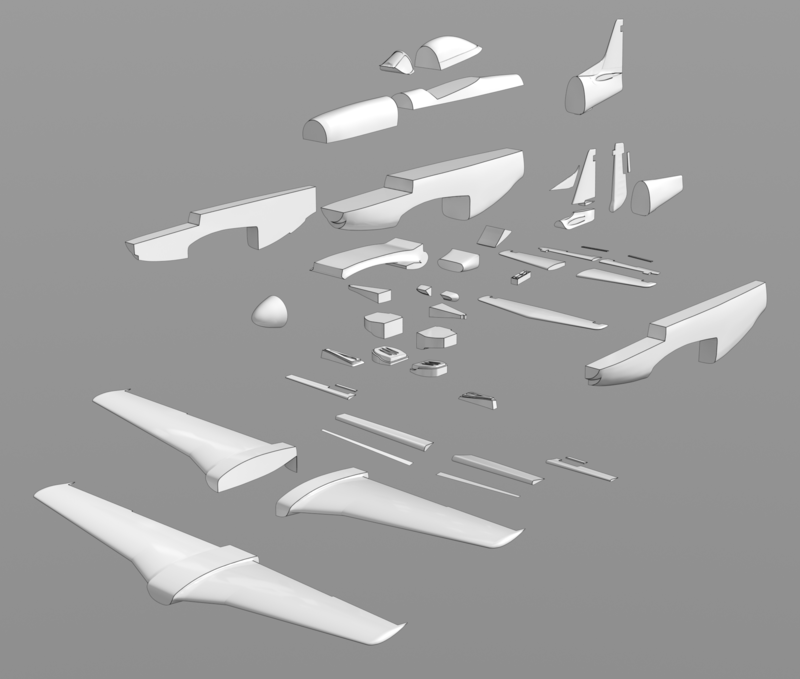 Finally, it was decided to make the fuselage cuts in several different ways too, so that if the one-piece versions (first image, below) were tough to fabricate, perhaps splitting these parts further, into left/right parts would work better. The end result of this is that BOTH types of wings were modeled, and the fuselage cuts were done in several different ways, to give my customer flexibility in fabrication and assembly. So, the first step was to redo the area of the fuselage where the wings mate. I want to point out that this customer was extremely positive during the process. Various parts of the plan changed during the process, requiring more time and more money, and he was totally understanding and considerate in regard to the increased costs. It's inevitable in a project like this that when both fabrication and assembly have to be considered, the process can become more complex than originally expected. He was unfamiliar with 3D modeling, and also unfamiliar with the machining/compositing process, so I made many videos for him along the way, explaining the "why" of what I was doing. Part of the process was explaining the difference between polygonal modeling in MODO, compared to the NURBS parts I'd eventually export, via the "Power subD - NURBS" plug-in. If you're looking at the fuselage wireframe, you'll notice that behind the scenes, this geometry was constantly tweaked and smoothed, during the entire modeling process. I'm a fanatic about this, but the fact is that the actual P-51 is "bumpy", because of the many panels riveted to the exterior. 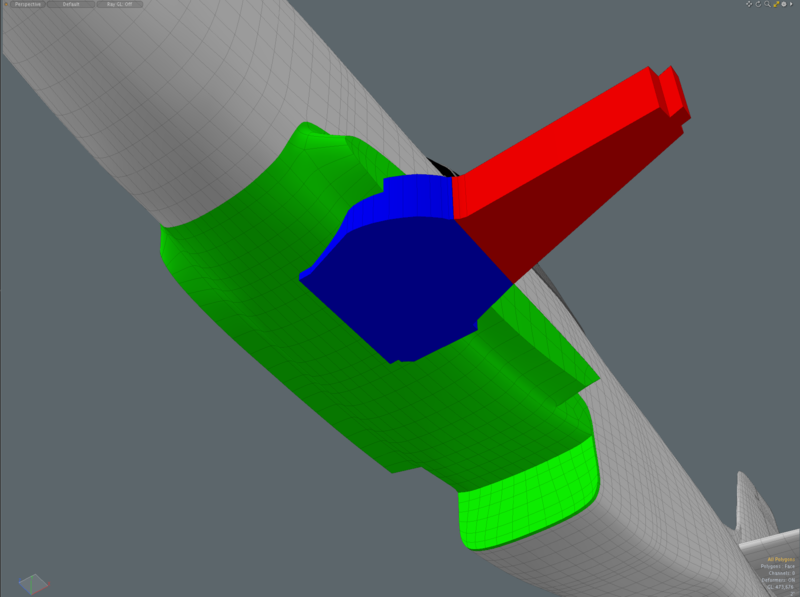 So the parts I've modeled, (even those which contain small bumps, are still smoother than the actual aircraft. Also notice that each time a cut was made in any part, it required joining edges, in order to keep all the parts solid, ("airtight") so that they could be machined. 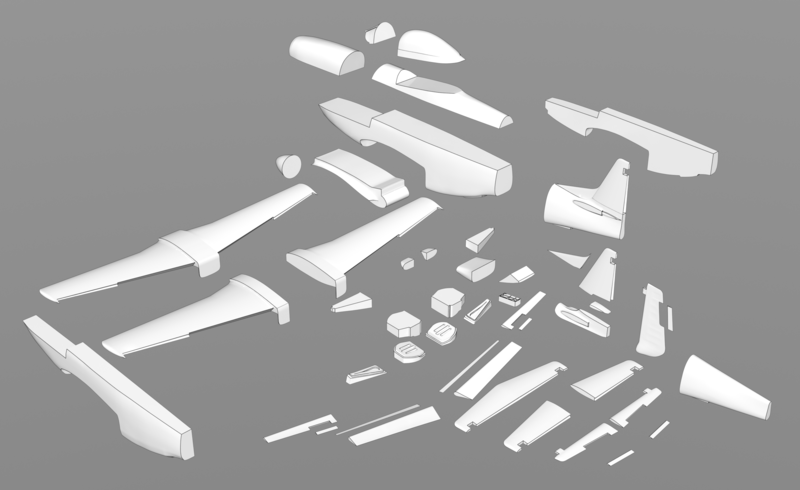 I kept the existing parts (shown above) for future use, and made a copy of the one-piece fuselage. 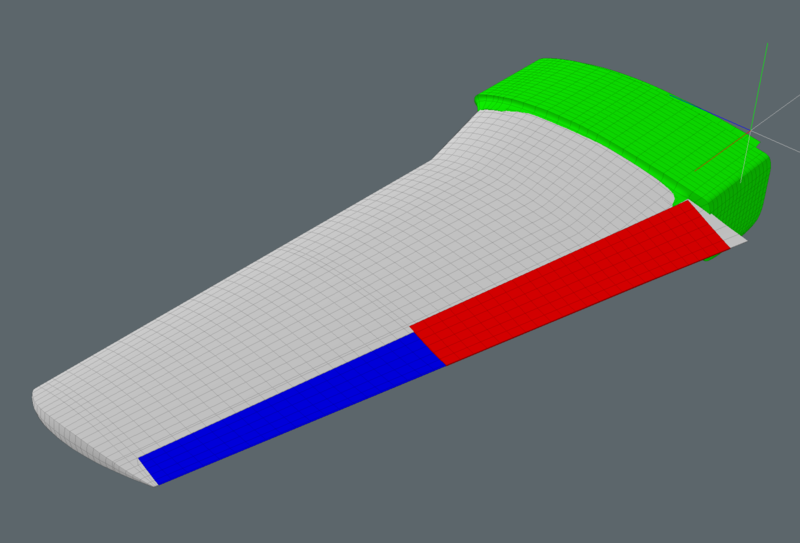 The area under the fuselage (in green) would be removed, and the interior of the fuselage would then have faces added, to make it solid again. The areas shown in blue and red are respectively, the inner and outer gear door cutters, which would be used later. If you've ever "traced" formers from drawings in a program like MODO, and then tried to connect them, you know that the line thickness on the drawings can cause slight inaccuracies in those parts. So, when you connect them, you'll have some "bumps" to smooth out. 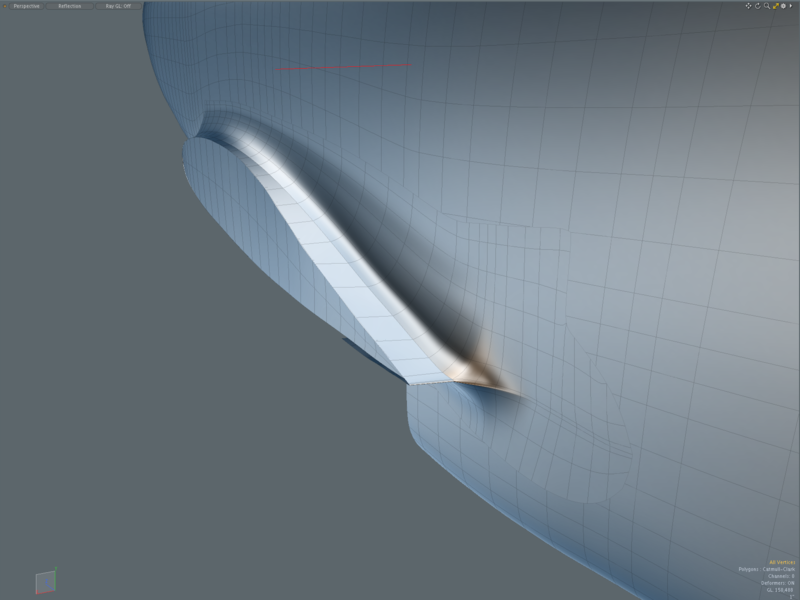 That's what caused me to keep smoothing and correcting the fuselage, as I mentioned above. With a laminar flow airfoil like the P-51's, this can actually cause problems in flight, because the airfoil is rather critical... Small differences in laminar flow airfoils change the performance. So, rather than trace all the ribs individually, I basically used only three ribs. One was at the center of the wing, the other was where the planform transitions outboard to a straight line, and the third was at the point where the ailerons' outboard edge is. Extruding between those gave a very smooth surface, with the appropriate reflex and twist. Then, I subdivided those polygons as you see below, to provide plenty of natural "cut" points, for joining areas after the flaps and ailerons were cut away. 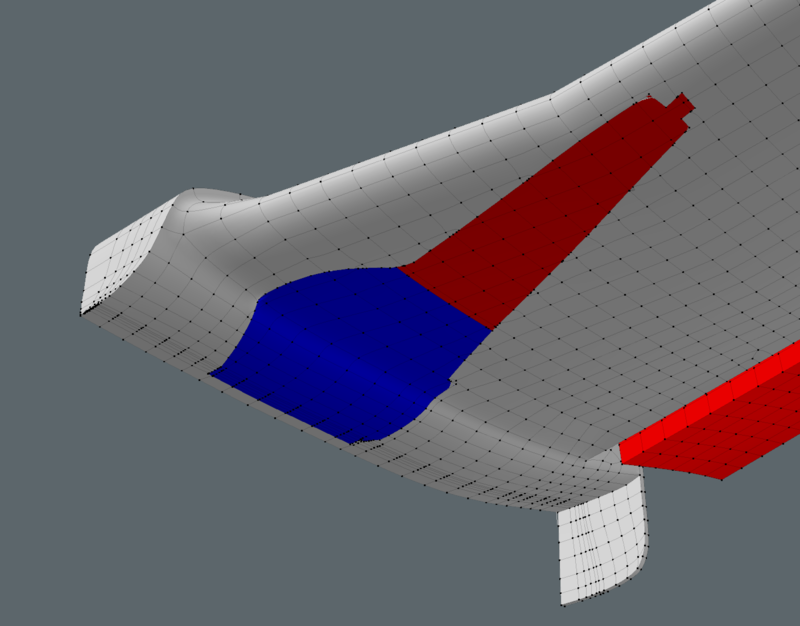 In these images, the wingtips haven't been smoothed yet, but that was easy to do later. After adjusting the center section geometry, I joined the left wing to it, and now we have a smooth transition, which will be equally applicable to either a one-piece or two-piece wing. 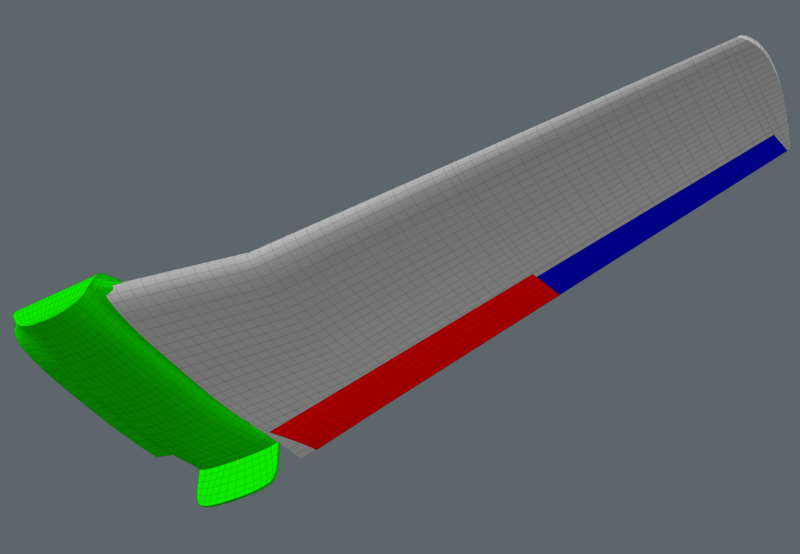 Sidenote: Later, this joint was smoothed to better emulate the actual P-51, which has a nearly continuous surface on the bottom, rather than the slight bend at the root shown here. 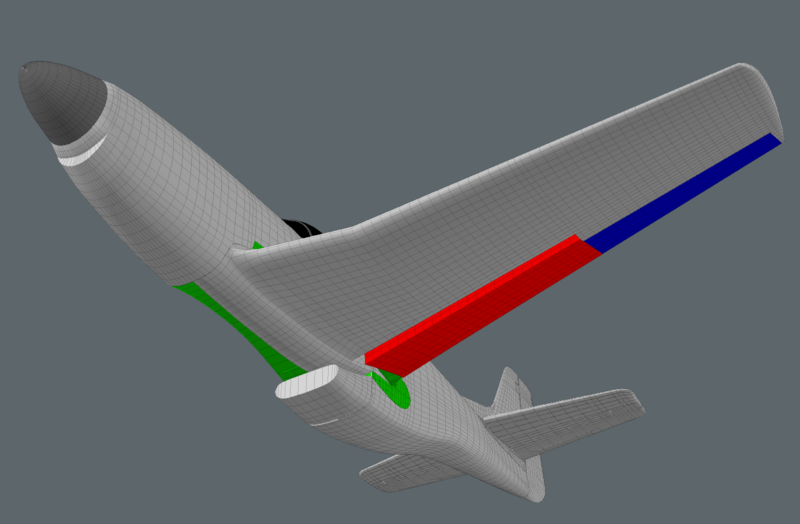 The flaps and ailerons have been cut out, but their leading edges, and the corresponding trailing edges of the wing have not been created yet. Next, I used the cutters shown previously and cut out the gear door areas from the wing. If you look carefully here, you'll see that since the gear doors have some edges that don't correspond to the polygons on the wing, some cleanup, as well as edge-weighting needs to be applied to these areas, for a good fit. And, as on the other parts, the interior of the gear wells needs to be constructed, so these parts remain solid. One other thing that had to be done to ALL the cutout doors is that thickness had to be added. In 3D, this would be a no-brainer, but for fabrication, a different approach had to be used, which I'll show next. One other thing that had to be done to ALL the cutout doors is that thickness had to be added. In 3D, this would be a no-brainer, but for fabrication, a different approach had to be used, which I'll show here. Keep in mind that these parts will initially be machined out of some sort of foam, and then pre-preg composite panels will be applied over the foam. Finally, the foam will be dissolved, leaving only the then-thickened parts. The gear doors required additional parts, to look more authentic. That is, they include some detail panels on the inside, which would show when the doors are open. These were modeled separately, as you'll see below. All "thin" parts, such as the gear doors, were provided with downward extensions, so that the composites could be added onto the forms in various thicknesses, while on a flat building surface. The same idea was applied to all the wing and tail fairings, so that the plugs were easily machined, allowing the composites to be added in various thicknesses. Horizontal stabilizer was provided in both a one-piece and two-piece version. The ailerons and flaps had rounded leading edges, but "wiper plates" were also provided, to seal the gaps where they join the wing, making them look better and also more efficient aerodynamically. Parts for the lower inlet were supplied in pieces that could be easily molded, if desired.. The canopy was supplied in two pieces. Both parts were intended to have a transparent material molded over these forms, and then the parts representing the supporting frames could be added below the transparent parts. Or... If the transparent material was strong enough on it's own, then the parts representing the frames could simply be painted to look like metal. This was a challenging, but fun project. I think every aviation fan loves the P-51, and producing parts for an actual man-carrying aircraft made it especially exciting. When my customer gets into the fabrication, assembly, and flying parts of the project, I'll either provide images here, or links to his personal site.